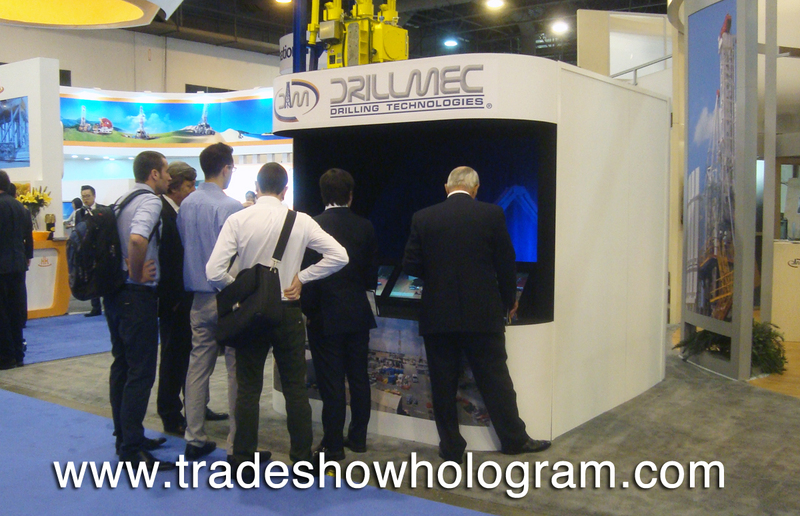 A 3 ft high X 5 ft wide 3D Holographic Projection was featured at the OTC 2014 in Houston Texas this May. Trade Show Holograms created this latest display to operate in any lighting conditions as well as offer trade show visitors more detailed information on the featured product via 3 video monitors located in the front panel of the exhibit. These monitors show more detailed close up video in addition to the 3D image floating in the air just behind them. This is the latest hologram projector design from Trade Show Holograms, a company providing North American Trade Shows with holograms since 2007. Trade Show Visitors watch a 3D holographic presentation.